More Airports in Asia-Pacific are going the extra mile to address their carbon emissions through the carbon management certification programme Airport Carbon Accreditation. Tan Sri Bashir (left), President of ACI Asia-Pacific presenting the Airport Carbon Accreditation Certificate to representative from Indira Gandhi International Airport, Delhi, Mr. Davesh Shukla (right), Chief Information Officer, Delhi International Airport (P) Limited. ACI Asia-Pacific is pleased to announce that three airports in India, namely, Bengaluru International Airport in Bangalore, Indira Gandhi International Airport in Delhi and Rajiv Gandhi International Airport in Hyderabad recently upgraded their certification to Level 3, ‘Optimisation’ while Sunshine Coast Airport in Australia has become certified at Level 1, ‘Mapping’ within Airport Carbon Accreditation. At this year’s 8th ACI AIRPORT EXCHANGE in Doha earlier this week, these airports were applauded in recognition of their achievements. Airport Carbon Accreditation is the only institutionally-endorsed programme specifically designed for the airport industry. It independently assesses and recognises airports’ efforts to manage and reduce their carbon emissions, on an annual basis. Participating airports can be certified at 4 progressive levels of accreditation as follows: ‘Mapping’, ‘Reduction’, ‘Optimisation’, and ‘Neutrality’. Currently 91 airports in Asia-Pacific, Africa and Europe are certified by the programme. These airports welcome 22% of global passenger traffic each year. Airport Carbon Accreditation was first launched by ACI Europe in 2009. 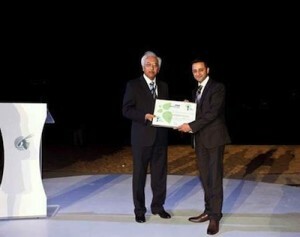 In November 2011, the programme received support from ICAO and was extended to the Asia-Pacific region. Airport Carbon Accreditation is an independent programme administered by WSP Environment & Energy, an international consultancy appointed to enforce the accreditation criteria for airports. The administration of the programme is overseen by an independent Advisory Board. Airports must have carbon footprints independently verified in accordance with ISO14064 (Greenhouse Gas Accounting). Evidence of this must be provided to the administrator together with all claims regarding carbon management processes which must also be independently verified. For more information about Airport Carbon Accreditation, please visit the website: http://www.airportcarbonaccreditation.org.